Each month the Regional Foundation Center newsletter features a local funder, nonprofit, or service provider who highlights their organization's services and how they support the social sector. This month we are excited to have Caity Tingo and Gillian Robbins, business librarians in the Free Library's Business Resource & Innovation Center, to talk about how the Free Library's business resources can help nonprofits. What is the Business Resource & Innovation Center? The Business Resource & Innovation Center (BRIC) offers business and nonprofit information, one-on-one research assistance, and networking opportunities, as well as lectures, classes, and special events. The BRIC at Parkway Central Library has an extensive collection of industry trade magazines, specialized directories, and subscription databases, making the Free Library of Philadelphia every entrepreneur and nonprofit professional's most valuable asset. 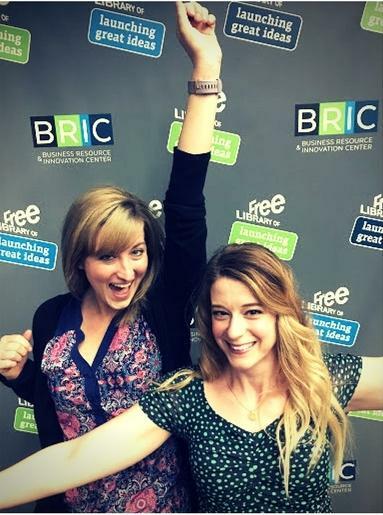 Moreover, the BRIC is one of three Pennsylvania libraries designated as a Patent and Trademark Resource Center (PTRC), part of a national network of centers maintained by the United States Patent and Trademark Office (USPTO). We provide access, free of charge, to intellectual property resources. How does the BRIC support Philadelphia's business and nonprofit communities? We support businesses and nonprofits by curating resources, developing programming, and conducting research! We are a friendly and accessible resource center which makes BRIC a great place to start, launch, and grow your business or organization. We are both Business Librarians. We create and present classes on Free Library resources, assist with business planning and growth (by appointment), and network with community development organizations to curate resources that complement or enhance our services. How can the business resources help nonprofits? We love telling nonprofits about the Reference USA: U.S. Consumers / Lifestyles database, in tandem with Wealth Engine! Reference USA: U.S. Consumers / Lifestyles is a hyperlocal database that allows users to build lists of people living in a metro area, city/town, or zip code. It’s very flexible because you can search based on income, interests (if they are charitable donors! ), and location. You can access names, addresses, and often phone numbers. Once you build a solid list, you can then search in Wealth Engine. You also have the option to search even more specifically using a feature called Consumer Snapshot to view a heat map to find high concentrations of potential donors based on age, income, gender, occupation, marital status, and more. Names and addresses are no longer available, but you can take a close look at a zip code to see how many individuals match your target audience. Reference USA: U.S. New Movers / Homeowners is also a great resource for community nonprofits and Community Development Centers to welcome newcomers to the neighborhood because you can search for people who have recently moved into a zip code. BusinessDecision is an invaluable resource for hyperlocal information on demographics, spending habits, and statistics on wealth and poverty. The information and reports from Business Decision are really quotable and make nice additions to reports and pamphlets. The Business Plans Handbook is a very clean and user-friendly ebook accessible via Gale Virtual Reference Library that has full-text business plans. We love this resource because you can keyword search to access business plans for almost every industry that can be quickly downloaded, emailed, and even imported to Google Drive. Oh, and did we mention that you can access all of these databases outside of the library in your home, office, or favorite coffee shop? All you need is your Free Library card number and PIN! What’s your favorite free resource? Caity’s favorite free resource is the Business Model Canvas. It is an awesome design thinking tool which helps you quickly layout ideas, business plans, and programs with a competitive edge. You can see a nonprofit ecosystem blueprint in action via the following article in Tivoni Devor's “Getting Good Done” column from Generocity.com. Gillian’s favorite free resource is the Census Business Builder. There are two editions: a Small Business Edition and a Regional Analyst Edition. The Regional Analyst Edition is more helpful for neighborhood-based nonprofits because it was designed for chambers of commerce and regional planning staff. It offers users a broad portrait of the people and businesses in their service area. It also provides data for all sectors of the economy for a region based on a city or zip code(s). You can create reports based on similar businesses, finance, diversity, and consumer spending. Don’t miss our Census Data for Grant Writing event on April 11 at Parkway Central Library. What is your best piece of advice for people using the library or doing research? Caity: Sometimes, satisficing is key. Don’t waste too much time looking for the perfect quote or statistic, when you could be spending that time actively working on your organization. Keep moving forward. Gillian: Don’t hesitate to ask a librarian for help. The BRIC is unique in the realm of Philadelphia business and nonprofit centers and resources because of our library-ness. We are not business and nonprofit experts, but rather librarians who are experts in research with thorough knowledge of the databases and resources available at the Free Library. You might be able to find exactly what you are looking for or what you didn’t know you were looking for. We are huge nerds and love data! Visit the BRIC website for more information on business resources, access the databases, or to make an appointment with a business librarian. What an honor and blessing to have such a talented, dedicated, informed daughter ! I would to set up an interview with a Librarian to join the BRIC program offered to Philadelphia residents. Marquita, you can learn more about the BRIC programs and services and schedule an appointment with a librarian by visiting freelibrary.org/business. Hi Brenda, I emailed you directly with a link to request an appointment at the Workplace. I look forward to working with you on your resumes! I'm free all this month. I teach Healthy Cooking in Philadelphia, NY, NJ. I would like to work on How to get in with more Health Fair, City Hall Health Fair. Jason Breinin - Small Business Lender/Market Leader for BBT: An Interview with BRIC Business Librarians...The Free library I an incredible resource. I would like to better understand resources available to my client and current prospects so I can better utilize those resources and refer my clients. Would like to potentially set up a time to meet and host a workshop(s) to help small business owners, entrepreneurs, and budding investors with their respective businesses. Email listed above, Number: 484-238-0465. Hi Jason, thanks for commenting! Please reach out to the business department directly at bric@freelibrary.org. Good morning, I would like to set up an appointment I need help formulating my business proposal for my non profit. I have put together some of the information . The email above is for my non profit, and I can be reached at BurkeS@chc.edu. I look forward to meeting with some one from the Bric .